The present case has been reported in the Journal of Urology Case Reports. 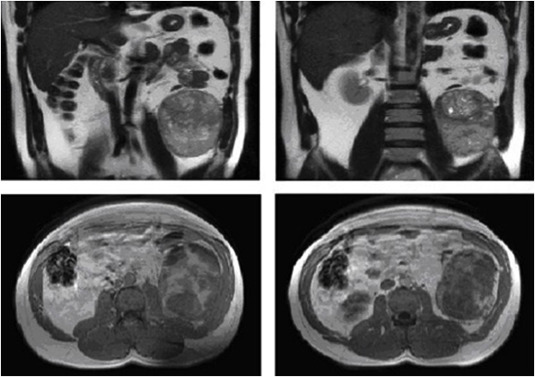 A heterogeneous solid mass lesion of approximately 9 cm in diameter with clear boundaries was observed in lower pole of the left kidney in the ultrasonography (USG) of a 58-year-old male who presented to the clinic with pain on his left side. In the subsequent computed tomography (CT), a heterogeneous mass lesion with contrast-enhanced necrotic areas and hydronephrosis were found in lower pole of the left kidney. Firstly, diagnostic left ureteroscopy (URS) was performed during the operation, and ureter and renal pelvis tissues were found normal. Then, the patient underwent radical left nephrectomy. No complication was observed in the postoperative period. The patient was drained on postoperative day 2 and discharged on the postoperative day 3 when the general condition was good and the vital findings were stable. Histopathology of the patient reported malignant mesenchymal tumor with hematoxylin-eosin (original magfication x 400). Surgical margin negative, and pT3a N0 M0. Since a definitive histopathological diagnosis could not be established on site, samples were sent to a more qualified laboratory. Immunohistochemistry examination of specimen revaealed strongly stain for CD 34 and CD 117. The histopathological examination at the higher-level laboratory was reported as GIST. 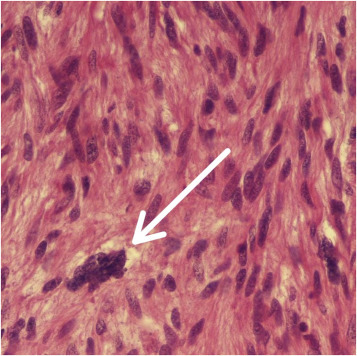 No residue or pathological finding that could be judged as metastatic was observed in the positron emission tomography/computed tomography (PET/CT) on 2nd postoperative month. The medical oncology clinic was consulted and the patient was started on imatinib by the oncology team. The patient currently has no clinical complaint and is routinely followed-up.